In 2007, pomegranates hit their peak of popularity in the United States. A news article at the time reported that over 450 new pomegranate-based products were brought to market that year. Stores were flooded with pomegranate juice and every kind of pomegranate-flavored food. Even Jelly Belly got into the act with pomegranate-infused jelly beans and Burt’s Bees made pomegranate shampoo! Today in 2018, pomegranates are still going strong, and pomegranate molasses is the current darling of the food world, appearing in many of the latest recipes in new cookbooks and on television cooking shows. This ingredient of Middle Eastern origins is simply pomegranate juice that’s been boiled down into a sweet/sour/tangy syrup. 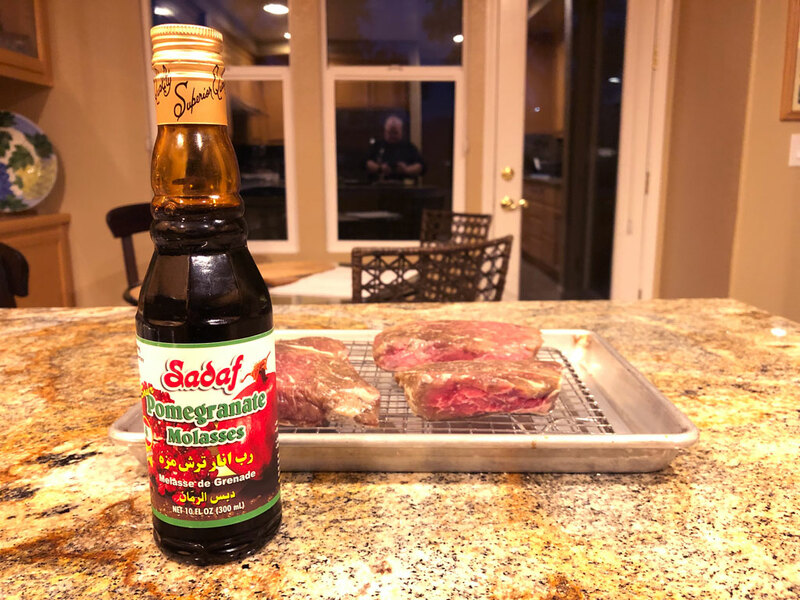 Pomegranate molasses can be used as a glaze on grilled meats, drizzled over roasted vegetables, substituted for vinegar in a salad dressing, mixed into hummus, and used in desserts and cocktails. I recently listened to an episode of Christopher Kimball’s Milk Street Radio podcast in which a phone-in caller asked about using pomegranate molasses with cooked meat. While Kimball suggested brushing it on full-strength at the end of cooking, co-host Sara Moultin suggested making a mixture of pomegranate molasses, butter, Dijon mustard, and a little garlic.